Some lawmakers were alarmed by the process and how quickly the legislation advanced. Staff in the Legislature and the governor’s office were also taken aback. Lawmakers, however, saw a need for urgency. OLYMPIA — State Sen. Mark Miloscia has long worked on public-records legislation in Olympia, and earlier this session had outlined a broad framework for increasing disclosure of the Legislature’s documents. But last Thursday, when Miloscia sat down to a rare joint committee meeting, legislative leaders put before him a sweeping plan to keep some legislative records under permanent secrecy. Despite his past work on the issue, Miloscia hadn’t been consulted on the new plan, and as the Republican from Federal Way flipped through the 24-page bill, he realized the measure was moving ahead with or without his blessing. Twenty-four hours later, with no floor debate and within minutes of each other, the House and Senate overwhelmingly approved the bill and sent it on to Gov. Jay Inslee. Miloscia’s surprise shows how closely legislative leaders held their public-records plan before unveiling it in the waning days of the legislative session. The bill would close off past records but make available some future documents, including calendars and email exchanges with lobbyists. Some lawmakers were alarmed by the process and how quickly the bill advanced. Staff in the Legislature and the governor’s office were also taken aback. Lawmakers, however, saw a need for urgency. In an email obtained by The Seattle Times, Democratic Rep. Ruth Kagi of Seattle wrote to a voter this week that lawmakers were hurrying because they were concerned about a “status hearing” scheduled for March 9 in a legal case that had favored media arguments for disclosing legislative records. That hearing could address which records are public under the ruling. And one legislative staffer familiar with the development of the records legislation said top lawmakers were so worried about whether Inslee would veto it that they were counting the days on the calendar. 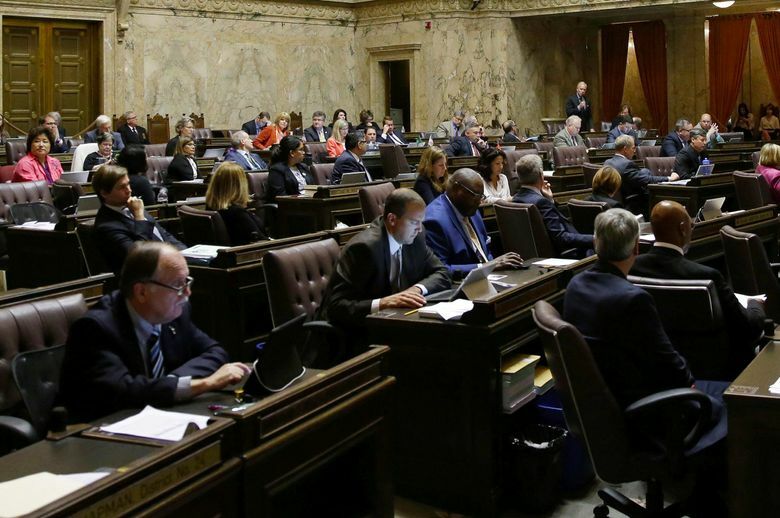 If the legislation was approved too close to the end of the session, the governor would have the option of vetoing it after lawmakers leave Olympia for the remainder of the year. Lawmakers instead approved it last week, forcing Inslee to veto or allow the law to stand by the end of day Thursday. If he vetoes it, the Legislature will have time to override the veto before the session ends a week later. The fight in Olympia over records has simmered for years. Reporters and open-government advocates have long argued that lawmakers are subject to the state Public Records Act, but legislative attorneys have interpreted the law as exempting the records from disclosure. After years of struggling to get everything from sexual-harassment case documents to lawmaker emails, media organizations — including The Associated Press and The Seattle Times — sued in September for access to legislative documents. Last month, a Thurston County Superior Court Judge sided, in part, with the media organizations. Judge Chris Lanese ruled that the Public Records Act applied to the offices of lawmakers, but didn’t cover the administrative offices of the state House and Senate. Sen. Michael Baumgartner, R-Spokane, said lawmakers had been discussing the records issue since the lawsuit was filed. After the court ruling, that discussion grew more urgent. Other lawmakers, including Miloscia, had introduced public-records bills. Rep. Gerry Pollet, D-Seattle, proposed making some legislative records available to the public while exempting others. Meanwhile, lawmakers were also looking at bills to exempt birth dates from public disclosure for state employees and voters. Media organizations sought to halt those measures, arguing that they would make it more difficult to investigate problems in government and the voter-registration rolls, or broader issues in which those records can be used. Concerned about those narrow measures, leaders from The Seattle Times and other news outlets made a rare showing in Olympia last week to discuss the issue with lawmakers. At a public hearing, journalists told a group of lawmakers about how the records can help hold people accountable. In a private meeting, House Speaker Frank Chopp assured the journalism leaders that he didn’t think one of the bills wouldn’t make it through the chamber. But behind the scenes, lawmakers were quietly putting the final touches on a much broader plan to create permanent secrecy for some legislative records. Senate Majority Leader Sharon Nelson, D-Maury Island, who became one of the bill’s two sponsors, declined an interview to discuss the measure. But a spokesman for Nelson said the bill was a joint effort among attorneys in the Legislature, with input from leaders from both parties and both chambers. Senate Minority Leader Mark Schoesler, R-Ritzville, also declined to comment. One legislative staff member, speaking on condition of anonymity, said leaders had been working on the measure for weeks but had only settled on the specifics in recent days. The person said the overall tenor of the plan would disclose fewer records than initial discussions had considered. Few others knew the details of the forthcoming plan. Sam Brown, a nonpartisan attorney on the Senate committee focused on state government, is normally the staffer who handles public-records legislation. He said the completed bill came to him on Tuesday night, Feb. 20. He wrote a report on the bill the next day. The next day in a text message, Rep. Richard DeBolt, R-Chehalis, asked Inslee chief of staff David Postman whether the governor would veto the bill. Postman said Inslee would have to decide, “though with veto-proof majority, he could potentially let it become law without signature,” according to the text messages, obtained by The Seattle Times. But, “No way he signs it,” Postman added. Jaime Smith, a spokeswoman for the governor, said Inslee and Nelson discussed the measure in a meeting last week but not in detail. Some lawmakers, including Baumgartner, said legislative leaders had told their caucuses that if they could pass the measure with a two-thirds majority, Inslee had vowed not to veto it. Smith declined to comment on details of the conversations. “At that point, we did not have a good sense of what this bill was going to look like,” Smith said. The governor also didn’t know the process lawmakers planned for approving the measure, she said. The Office of Attorney General Bob Ferguson was also not consulted on the bill, according to the office. The plan moved forward quickly, starting with a Wednesday, Feb. 21, afternoon news release in which Republican and Democratic leaders in both chambers touted the legislation. Sen. Reuven Carlyle, D-Seattle, said he knew efforts were underway to draft legislation over the last couple weeks, largely involving attorneys for political caucuses and legislators with legal backgrounds. When lawmakers met in their caucuses on the issue last week, Carlyle said it was presented to them as the option on the table, rather than something that would undergo changes during committee hearings. Carlyle said he sees both a need for legislation on the issue and protections for some records. But he and Miloscia were two of seven senators to oppose the bill. “I was just incredibly uncomfortable with the process,” Carlyle said. In the caucus meetings, lawmakers largely focused on the technical aspects. Carlyle recalled the Democratic conversation focused on how records would be subject to disclosure — such as future calendars and email exchanges with lobbyists. Miloscia said the Republican lawmakers had questions but didn’t seem concerned about the plan. Miloscia said legislative leaders never explained to rank-and-file lawmakers why SB 6617 didn’t go through the traditional committee process. Instead, a work session was held on Thursday, Feb. 22. “Part of that is because it will be very difficult to amend a bill on this fast track,” said Hunt, who chairs of one of the government committees. Since the bill passed the Legislature last Friday, lawmakers and the governor’s office have been inundated with messages. Of the thousands of messages and phone calls that have poured into the governor’s office, almost all opposed the measure, Inslee’s office said. On Tuesday this week, newspapers around the state published front-page editorials calling on Inslee to veto the measure. Inslee now has the option of approving the bill, vetoing all or parts of it, or letting it become law without his signature. While the measure passed the Legislature with a majority large enough to override a veto, it’s not clear that the bloc of voters would hold strong enough to do so.